Older adults can also dare to climb the Huayna Picchu mountain. They just need to stay in good physical condition and book the ticket in advance. The ascent must be slow but sure. The only requirement is the desire to reach the top of a Wonder of the World. Is Huayna Picchu accessible to older adults? 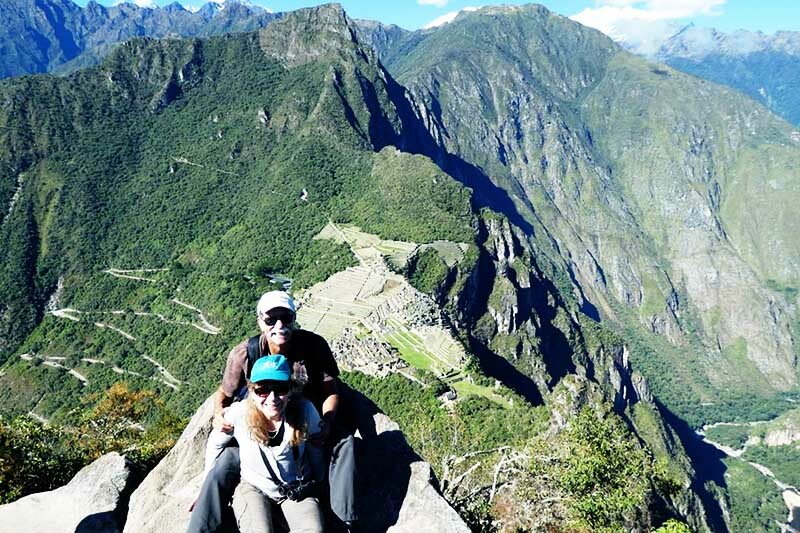 What Huayna Picchu group should you choose? How much does the Huayna Picchu entrance cost for older adults? How long before booking the Huayna Picchu entrance? How to book the Huayna Picchu entrance online step by step? Huayna Picchu is accessible to anyone over 12 years old. However, the trails of this mountain have very steep paths. For that reason, older adults need to be in good physical shape. Many older adults are encouraged to climb the Waynapicchu. For this they need to fulfill 3 requirements: be physically well, adapt to the height of Cusco and consult with your doctor before the trip. People from all countries and all ages ascend on the trails of the Waynapicchu mountain. Older adults should do it at an appropriate pace for their physical condition. The most important thing is the desire to reach the top. Huayna Picchu (also known as Waynapicchu) is located 2,720 meters above sea level. It is located in and north of Machu Picchu. Group 1: Entrance to Huayna Picchu from 7 am to 8 am – You can stay at Machu Picchu until 1 pm (200 tickets available per day). Group 2: Entrance to Huayna Picchu from 10 am to 11 am – You can stay at Machu Picchu until 2 pm (200 tickets available per day). Group 1: The people who make the ascent to Huayna Picchu in Group 1 (entry between 7 am – 8 am) enjoy a cooler environment. The physical wear, consequently, is less. Once at the top, the landscape could be covered with clouds (especially between November and March). However, with the passing of the morning, the cloudiness dissipates and Machu Picchu shows all its beauty. Group 2: Visitors who ascend the Waynapicchu in Group 2 (entry between 10 am – 11 am) make the climb with a bright sun. This could cause greater physical exhaustion. However, at that time of day, Machu Picchu shines with beauty During the dry season (between April and October), the Wonder of the World shines with a warmer and more beautiful environment. A good option for older adults is to choose Group 1: the sun does not wear away much from the visitor. Wear trekking shoes for a safe ascent. Entrance Machu Picchu + Huayna Picchu 200 S/. 112 S/. * The countries that make up the CAN are Peru, Colombia, Ecuador and Bolivia. University students and minors enjoy a special discount on the price of the Huayna Picchu ticket. They only need to have a university card or identity document that proves their age. The entrance to Machu Picchu + Huayna Picchu it is one of the hardest to get due to its high demand. Whether you are a older adult citizen or any other person, to get a ticket, you must book months in advance. If you plan to visit Waynapicchu during the high season of tourism (from April to October), you must book the ticket up to 3 months in advance. If the visit will be made during the low season of tourism (from November to March), we recommend making the reservation with up to 2 months in advance. To book the Huayna Picchu entrance online you must enter a web page authorized by the Ministry of Culture of Peru to offer tickets to Machu Picchu. Go to boletomachupicchu.com and enter the ‘Availability’ tab. Locate the calendar and select the entry Machu Picchu + Huayna Picchu in the group and day of your choice. If there are still tickets available, click on “Reserve Now”. Complete the booking form with your personal information. Read and accept the terms and conditions before you ‘Send’ the information. Send an email to info@boletomachupicchu.com with the copy or digital photo of the passport or identity document. As soon as possible, you will receive a PayPal payment invoice in the inbox of your email. Verify that the data and the amount to be paid is correct before clicking on ‘Pay Invoice’. Once the payment is made, you will receive an email with the entry Huayna Picchu reserved. The tickets are in PDF format. You should only print it and present it the day of your visit to Waynapicchu mountain. Paying with PayPal is easy. You only need to register a Visa, MasterCard or American Express credit or debit card. The money is sent immediately. The train schedules to Machu Picchu are the same for visitors of all ages. The prices of the trains are the same for adults and adults. OFFICIAL prices for Peru Rail trains (Ollantaytambo – Machu Picchu round trip). Official prices of Inca Rail trains (Ollantaytambo – Machu Picchu round trip). Check with your doctor before visiting Huayna Picchu Mountain, especially if you have heart problems or high blood pressure. Use the first days of your trip to acclimatize to the city of Cusco. Avoid heavy meals and drink coca mate to counteract the effects of ‘altitude sickness’. The day before your visit to the Huayna Picchu mountain, spend the night in the town of Aguas Calientes. Rest and sleep well the day before your visit to the Waynapicchu mountain. Wear non-slip shoes, water to rehydrate, sunscreen and a hat or cap. Take a rubber-tipped cane with you, if necessary. Metal-tipped poles are not allowed. During the ascent to Waynapicchu, try to climb slowly and safely. Take your time to take the best pictures of the Wonder of the World. ← How to pay the ticket Machu Picchu without a credit card?